The classic phaser found in rigs of guitar's elite! 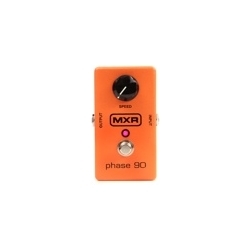 The MXR Phase 90, the wildly popular phase pedal, has found its way into the rigs of guitarists as wide ranging as Eddie Van Halen to Dave Grohl to Josh Homme to Nancy Wilson, as well as countless other discerning guitarists looking to add a touch of shimmer to solos. The Phase 90 also provides smooth, watery effects to chords and muted strumming. Not just confined to guitar, the Phase 90 fares equally well on bass, keyboards, or vocals. - Classic phasing in a compact pedal!